*Please read The Legend of Zelda and the Bible Part 6: Worship, Prayer and the Goddess before continuing. Even in Skyward Sword, the demon Demise said that an incarnation of his hatred would forever follow those who “share the blood of the goddess (Princess Zelda) and the spirit of the hero (Link).” Link’s spirit-the part of the Triforce that is identified with him (the Triforce of Courage), is that of the goddess Farore. By the Bible verses we’ve seen, it can be said that Farore is the “another spirit” mentioned in 2 Corinthians 11. Nayru, the goddess of Wisdom, is said to have “poured her wisdom onto the earth and gave the spirit of law to the world.” While Din, the goddess of Power is said to have “with her strong flaming arms, cultivated the land and created the red earth.” Try 1 Chronicles 22:12, Ephesians 1:17, Colossians 2:1-3, Romans 8:2, Daniel 2:20, James 1:5, Psalm 62:11, 1 Corinthians 1:23-24, and 1 Corinthians 1:30. This entry was posted in Uncategorized and tagged another gospel, another Jesus, another spirit, Bible, Demise, demonic, Din, evil, Faore, Golden Goddesses, KJV, kjv bible, Link, Nayru, The Legend of Zelda, Triforce, Zelda. Bookmark the permalink. I pray that I am worthy to wear the crown of life. I regret my sins and although I sin, I do try to get rid of my faults. It is not easy since I am flesh. As flesh I am not strong, but I pray that my father gives me strength through the holy spirit to lead me the right direction. I have played Ac 1 and AC 2, yet I knew what I saw is wrong. I also have AC BH and AC Rev. Those are still sealed in its packaging, but from what I am learning I know that it is not a good idea playing them. Be aware of Wolfenstein and so many other games films and books all around us. Satan’s works are everywhere. We have one Savior, do not be deceived. I feel you are discrediting a symbol that could be used for what we all believe in. You are talking about a children title here. Many kids do not know what symbol represents the father, the son, and the holy spirit. It doesn’t matter what symbol is used, but that the heart is in the right place. The characters used for a STORY to give a background to a symbol that is meant for a purpose of a STORY is by choice used for what it is about. Anyone can be taught what word says, and learn to follow and understand overtime. If a child, or adult plays a game like this one which has the triforce in it and allows this symbol of these characters than yes it would be worshiping a false god, but is it not in the bible that Our father knows our heart? If I take a triforce symbol, or I take the celtic knot or a cross. and believe in my heart that any of these symbols represent either Jesus on the cross in which he died for my sins, or the father, son, and holy spirit where is it wrong to think this. You know these games and the word and choose to discredit every aspect of these Zelda titles with the word of God. Please explain this to me. Where in the Bible does it say that something fictional is against the word of God. Jesus himself even spoke of fables to help his followers understand what the word of God means. I fully believe that one person or more created such titles to help children and adults alike understand the word of God easier as Jesus himself spoke of stories that helped shed light on a topic where someone didn’t understand. It is true that there are characters that can be portrayed as such people referred to in the Bible, but sadly enough in the U.S.A. if you create a game or story that involves the word of God. It will not sell, it will not easily reach people, so again I believe these titles were created the way they were for sales, to reach people, and teach as well. In these games I as a child learned patience, I learned how to problem solve, I learned and feel I understand the bible more clearly than I did before. But most importantly I had fun. It was a game first and foremost. If every fictional story is ripped apart to belittle because of the Word of God. Than fantasy would not be something we could enjoy. escape reality for a moment. I came to this site to find references to the bible as I noticed many of them myself, and wanted to share them with people after evidence was found. What I found was a site of someone ripping apart GAMES, FICTIONAL STORIES WITH FICTIONAL CHARACTERS, and trying to explain to people that its wrong to play. I am seriously upset the more I read this site. Why? Because if people like the author of these articles can use the word of God to mock a game, a fantasy, and even a positive outlook on life. What do you think will stop others from wanting to discredit the Word of God. As christians we are to bring people in. Why would you mock and talk down on GAMES and STORIES using the word of God and expect to do just that? If I wore a tattoo of a TRIFORCE on my body I could and I know I could easily bring people in to the word of God, and not something fake because I believe that the symbol has nothing to do with whats in my heart, neither does the story if I were to use it as an example of the real thing to help someone understand. In fact couple years ago I helped someone re new their faith in the word because of the references between the Bible and “The Legend of Zelda: Ocarina of time”. I can go on and on. and if I have repeated myself its because of how upsetting this is to read. I do hope to read comments and debates are welcome. Lets talk I am so down for such a conversation. Thank you for commenting. I will reply to both of your posts with one response. What you said encouraged me to do something I have been putting off for a while. As a result, I am currently writing The Legend of Zelda and The Bible Part 6: Skyward Sword’s Triforce, Prayers, and Goddess. As a fan of the Zelda series, have you played Skyward Sword? If you have, you know that players must say prayers to Hylia (the goddess) at bird statues in order to save their progress. Near the end of the Wing Ceremony, the player gives a bird statuette to Zelda so she can offer it to the goddess. At the intro of the game, we see people bowing down to the Triforce. Near the end of the game, Link must pray to the Triforce to defeat the demon Demise. In The Legend of Zelda: Wind Waker (which they are now remaking in HD), we see people bowing down to a Triforce, and praying to the Golden Goddesses for help. Is it still a sin to do so, even if it is only in a video game? Let’s say I was invited to a costume party and didn’t have an outfit, and so I go to a costume shop to pick one up. Let’s say I choose a pair of red devil horns and think, “this reminds me of the horns of the Lamb of God,” and I wear it to the party. That does not change the fact that they still represent the devil. Likewise, if I take the Triforce and apply a Christian meaning to it, that does not change the fact that it represents false gods, idols and (according to the Bible) devils. It also does not change the fact that the Triforce is often an object of worship throughout the series. “These things said he in the synagogue, as he taught in Capernaum. Many therefore of his disciples, when they had heard this, said, This is an hard saying; who can hear it? I don’t write these articles to “rain on someone’s parade,” and I don’t write this to belittle you. I write these articles because whether something is fictional or not, I believe God cares about every aspect of our lives. People deserve to know what the Bible-the perfect word of God-says, even in regards to entertainment. If the Bible shows that something is wrong, wicked or evil (such as false Christs or Another Jesus), it is that. Is someone going to Hell just over a video game? No, they would go to Hell because they did not believe on Jesus Christ. However, if I as a born-again Christian am convicted over a game, and God has shown me things in the Bible that point to it, and I still play…I will have to answer to God for my willful disobedience. After being saved I was ready to give up gaming entirely. However, after a period of time, God has given me the liberty to play certain video games, and the knowledge to write these articles. I pray that God helps you, and leads you whichever way he wants you to go. If you play games and aren’t convicted then look for connections between them and Christianity. Zelda, at least the original, is full of Christian tidbits. I see that in a later comment you referenced this. So I can also see that you are knowledgeable in it or at least can research, and that is good. I feel like the creator of the series gave up eventually on trying to press Christianity into the series if it wouldn’t end up in it thanks to final checks. I also feel like the series could be a warning like Solomon and his wives that led him astray. But literally anything can be an idol if you let it, even the Bible could be if you put the Bible above God. As long as you keep an eye on what you think by it, and don’t use it for nothing, then it could be a tool actually for connecting with others and leading someone to Christ potentially. Thanks for your comments, Colin! As for using scriptural parallels to video games to connect with others and even lead them to Christ, I absolutely agree with you, we can and should do that. God’s Word can apply to anything, really–not just entertainment. However, the parallels drawn can be quite negative as well as positive. That’s why I started Video Games and the Bible. To keep a balanced Biblical perspective, it’s important to note the serious problems (such as the forced worship of idols by players we see in Skyward Sword or the crucifixion of Dante in the Devil May Cry anime) in media we enjoy in addition to any potentially positive messages we may find. ……I feel like you probably answer repeat questions and comments a lot, don’t you? I believe that the Lord can reach our hearts through any means, video games included. 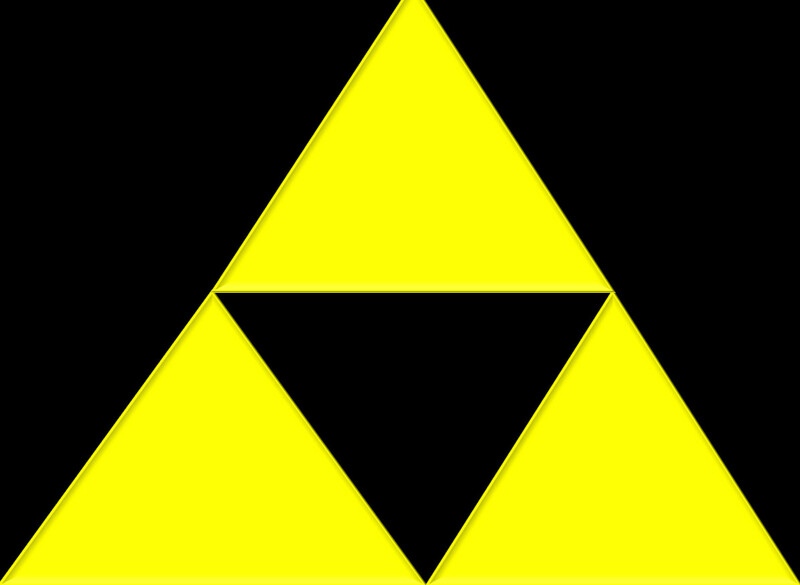 When i first saw the triforce, i immediately thought of The Holy Trinity, One God, three persons. Heck, there are people who can show you a deck of playing cards and recite a verse, event or person from the bible for each card. i.e the joker as the devil etc. I have yet to see anyone raise a hullabaloo about that. I can totally see where you’re coming from with that other group of 3, but my heart is with the lord and as long as i dont lose sight of that, i believe i am pretty safe when i pick up my copy of Ocarina of Time. Hi Robin, thank you for taking the time to comment. I do believe that God can use anything. I also believe that we as Christians have liberty (Galatians 5:13-14), and can generally play video games (unless God directs someone otherwise). However, there is something I would like to address. Don’t get me wrong, I played and loved games like Zelda, Assassin’s Creed, Halo, Alan Wake, etc. Now that we know the truth though, we can’t just ignore it and continue. If we do, we will have to answer for our knowledge. As a born-again Christian, I trust the Lord will guide you whichever way he wants you to go. I pray the best for you. i read the bible too and pray but i didnt feel God stop or silence me when i asked for that game 2 christmases ago, and its not like i worship the triforce. No, i worship and adore the Lord Jesus, thing is, at the time when i wrote my first comment yesterday, i wondered if anyone else saw The Father, Son and Holy Ghost in the triforce. I found your blog, listened to the article and at the end, couldnt help feeling like i had been convicted, tried and sentenced for liking Zelda. I thought to myself “Geez, what’s next? a hidden biblical commandment that says “thou shalt not read Winne the Pooh*? I mean seriously, no offense, but instead of giving me pause to think, this article frightened me a bit. Until i was led to look at some christian artworks where the trinity was represented by not only their physical forms, but by….thats right, a triangle . A golden triangle no less. And here’s another tidbit i found. (forgot where i read it) But, before implementing the 3 goddesses, the main religion behind the Zelda lore was rumored to have possibly been Christianity. Hi Robin, thanks for commenting again. God will usually not stop someone from playing or asking for a game like this. We have free will. However, once we have knowledge, we are held accountable for it. You said you, “couldnt help feeling like i had been convicted, tried and sentenced for liking Zelda.” My intention is not to judge anybody, but to give information about various games according to the Bible. How this information makes you feel is between you and God. Also, as I’ve said before, it’s not like we as Christians do not have liberty. One final thing. You said “before implementing the 3 goddesses, the main religion behind the Zelda lore was rumored to have possibly been Christianity.” This certainly seems true. There was a Bible in the first Zelda, a cross in the second, and a promotional picture of Link kneeling before a crucifix in the third. The third game also contained a church and priest that were renamed in the US release. However, the “Christianity” in the series was REPLACED by the Triforce and Golden Goddesses. This replacement has reached its logical conclusion, with the player having to offer prayers to the goddess Hylia through a bird statue to save their game in Skyward Sword. just to correct some information on the author’s part, the spirit of the hero from Skyward sword does NOT equal the triforce of courage. they are separate entities in the lore. i do agree with you on the fact that God judges us not for our video game habits (unless perhaps they get in the way of him! lol) i just want to remind us all of romans 14, where it discusses disputable matters. to some extent, i do feel that video games would fall under that category, and so we should all be carefull about how we talk to people about certain games becuase we do not know where they are coming from or what their background was. as neslon as stated here, he was addicted to video games, and i feel like to some extent that is why, for him, there are issues with certain games. i get that. im not going to judge him for something he might posssibly feel is wrong to play. The master sword, in game, is the most powerful weapon ever, and has the power to banish evil. it is also called the blade of evil’s bane. this correlates wit the fact that the word of God is what judges evil thoughts and attitudes in the heart. the heart is filled with evil, as Jesus says in mark 7:21. that evil is banished when we accept Jesus as our savior, and Jesus is the one who holds the two edged sword in revelation, as well as is called the word of God in John. the word is also a sword in hebrews, that cuts through to the heart. so there you go, just something i found a while back that i found very interesting. no i don’t think Nintendo intended these connections to be there. in reality it is purely a game play mechanic. but it is a very interesting connection. Hi smcrzgi, thanks for taking the time to comment! First of all, while the Spirit of the Hero and the Triforce of Courage (Farore, Goddess of Courage) are “separate entities in the lore,” I believe a case can be made for their connection. According to the Bible (as in the example of Farore’s Wind and the Goddesses ascending into the heavens after their work was done), Farore can be classified as a spirit. In almost every Legend of Zelda title, the Triforce of Courage is seen to be the part of the Triforce most attuned with Link (even appearing tattooed on his hand in several titles). For this reason, I believe saying that Farore is Link’s personal spirit is a valid statement. Second, I would say I agree with you when it comes to Romans 14 (you can see this in the Skylanders and the Bible Part 1: Idols comment thread). However, while it’s good that the elements you pointed out in Twilight Princess cause you to remember God’s Word (and it’s true that God can use anything), I don’t think that necessarily makes them positive. In fact, I’d say they reinforce the message of the article above. So, as you can see, this is still a replacement of God with other deities, and his Word by a false Light/Sword. I don’t belittle or judge your playing the Legend of Zelda series, but this is the reason I started Video Games and the Bible–so that Christians could know and consider the moral/biblical content in the games they play and take it to God. Thanks again for your respectful addition to our discussion of Video Games and the Bible–I hope to hear from you again in the future! first, your right, Farore would be classified as a spirit, if she were real. and the triforce of courage is associated with link lots of times, your right. but it is a big leap in logic at that point to assume that becuase in a lot of games link has the triforce of courage, that farore is literally the heroic spirit. question: in wind waker, ganondorf has the triforce of power. does this mean he is supported by din? that can’t be the case, as din, as well as the other “gods” flooded hyrule to stop him. this even becomes more evident when you think about the games where Link gets the entire triforce, or has the whole triforce on his hand not just that of courage, games like skyward sword, the oracle games.adventure of link, and a link to the past. i find it odd that you make that leap. secondly, if the spirit of the hero is to be associated with any of the fictional dieties in zelda, it would probably be hylia, rather than farore. also, the master sword was not created by the golden goddessess. you talk alot about skyward sword, but due to that one comment i question if you have played it or even read a wiki page on it.. if your going to discuss zelda lore, i highly suggest you maybe research it a little bit more. secondly, i did say that yes i knew the “gods” of the twilight were false. i was not emphasizing lore accept on the point that the mastersword can banish evil. i was more so focusing on the gameplay mechanic. you say that in the game God is replaced by false gods, and i would agree if the games were real life, but they arent. the universe that zelda takes place in is purely fictional. the gods in zelda were never really real and therefore dont actually replace God in anyway. all i was saying was that the fact that in that section of the game, the fact that the mastersword is a light, as well as a tool for banishing evil, has a strong correlation to what the bible says about the word of God. just becuase it was the “gods” of the twilight that did it doesnt phase me. why not? because those gods are not real to begin with, as well as the sword, nor were they meant to be confused as such. their fictional. God can’t be replaced by fictional characters that are obviously supposed to be fictional. for example, in the lord of the rings, gandalf comes back to life. aragon is the one who heals people in the city of minas tirith. frodo is the one who carries the burdan. there are other gods, called the valar. are these characters trying to replace Christ and become a second, false version of christ to decieve the people in their stories? these stories weren’t meant to be allegorical in any sense, according to the author, so is this a replacement of God by false beings? id say no, especially when you consider that the stories were written by a christian. the fact that these elements though seem to emulate christ, would to me, bear evidence that God was still influencing tolkien’s thinking when he wrote his mythology (which is largely based on norse mythology actually). now of course, in the case of zelda, i dont think the creators are christian… and as far as i know, the christianity that was in zelda at first, wasnt very strong, as the japanese understanding of christianity is rather weird to be honest. and the fact is that zelda has taken a more mythological route. i think that, while we should be conscious of what is actually in zelda (which is actually influneces by alot of different religions, mostly japanese spirituality (cant remember its name off hand)), the fact that the stories themselves are clearly meant to be fictional makes them neutral to some degree, and depending on where your values are at, and what your walk with God is like, and what you have agreed to abstain from with God, (again, romans 14 and 15 here, disputable matters) and where your coming from, that will largely influence how you take and understand content in games. personally, i find for myself no reason to assume that the “gods” in twilight giving the mastersword its light is somehow replacing Gods light and his word, because both the gods and the sword are works of fiction. for you that may not necessarily be the case, and im ok with that. and im glad that you seek to point out what types of spirituality may be hidden within the zelda series. thats what the website pluggedin does, and i think its fantastic. (not that im not aware of such content in zelda already as im a fan of the games, but others may not be as knowledgeable). what i find troublesome is that you saw what i wrote about what I saw as being God possibly influencing a gameplay mechanic to point to him, and went and wrote about how that the false”gods” are creating a false light and a false sword that is somehow meant to replace God (even after i wrote that i wasn’t emphasizing the fact that in game it was fictional gods)… well of course their false! its clearly obvious that they are! my point wasnt that the mastersword is the representing the true word of God, in a sort of allegory. obviously this isnt the case as zelda is not an allegory at all to begin with. all i was trying to do was show that while, yes there is negative content in zelda, there is also positive stuff if your looking for it, and only doing so understanding that the world that zelda takes place in is fictional. i just cant see how that replaces God in anyway, when the games (as well as their content) are clearly a work of fiction. we do need to be aware of what is in games before we play them, and make conscious decisions based on that info and on what our thoughts between ourselves and god are on such content on whether we can play them or not, but we also need to be aware of what is fictional and what isnt, and treat them as they are, fictional or not. zelda is purely a fiction, but i think we both can agree the bible is not. Hi smcrzgi, thanks again for taking the time to comment. First, I’d like to apologize for my mistake regarding the Master Sword. The Master Sword was actually created by the Goddess Hylia, and DERIVES its power from the Golden Goddesses (seen when The Goddess Sword is transformed into the Master Sword after being purified in the sacred flames of Din, Nayru and Farore). As far as the “leap in logic” regarding Farore, Farore is both the part of the Triforce identified with Link (who is the embodiment of the Spirit of the Hero) and a spirit. Thus, I determined Farore is Link’s spirit. I totally understand that “the world that zelda takes place in is fictional.” However, the elements I describe in the article above, my previous comment, and The Legend of Zelda and the Bible Part 6 are still symbolic of a replacement of the one true God–whether fictional or not. Do you know what it feels like to be “burned” by a video game? To be so excited for a new release and ultimately find yourself crushed because you encounter an element that is egregious to your faith? I think that is a situation most Christian gamers (myself included) have encountered. That is why I operate Video Games and the Bible: to give Biblical information about these fictional universes to those who are interested so they can make an informed decision about what they play with the guidance of the Holy Spirit. Thanks again for your comment and God Bless!